Several of our kits are designed to help students learn more about geology. so much more about the wonderful world of Geology! Here are just a few of our more popular kits! 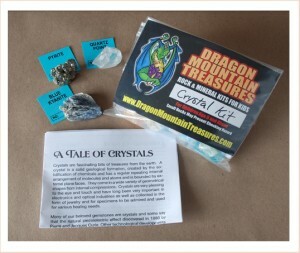 Be sure to check out the shop for more kits, rough and tumbled stones, geodes and fun accessories. Our most popular kit! 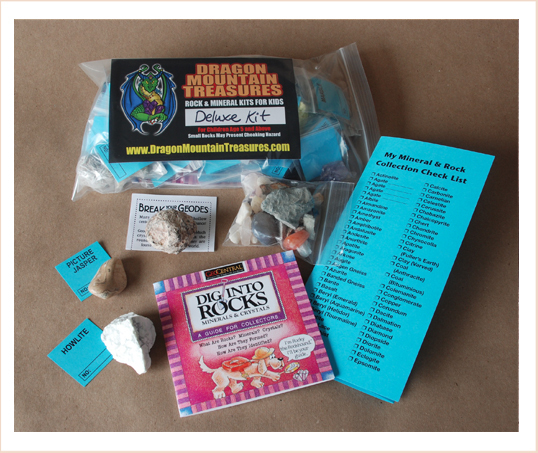 You get 25 individually bagged and identified specimens, the Dig into Rocks full color booklet, a nice collection checklist, a little bag of mystery mix for you to sort through and a geode to break open! It’s the perfect way to start a rock and mineral collection or add to the one you’ve already started. Click here to order or for more info! This kit was designed with younger children in mind. We try our best to ensure that all the stones are a larger size than normal, so their is less time worrying and more time having fun! The kit includes 15 specimens, a hand made collection bag with lots of room of all kinds of treasures and a full color ID sheet! Great for introducing your little ones to geology! 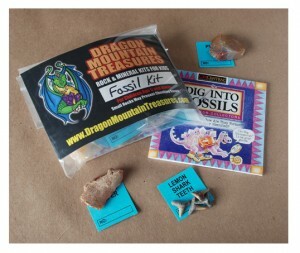 This kit is perfect for your budding paleontologist! Generally included are popular favorites like Petrified Wood and Shark Teeth. You get 10 individually bagged and labeled specimens plus the full color Dig into Fossils booklet! All fossils are legally purchased from wholesale sources. Who doesn’t love beautiful crystals! They have inspired awe and wonder through the ages and are always a favorite of rockhounds everywhere. We have done our best to create a kit with beautiful specimens at an affordable price. You get 10 individually bagged and labeled specimens, plus an information sheet on some of the more common crystals! We have even more fun and educational kits available! 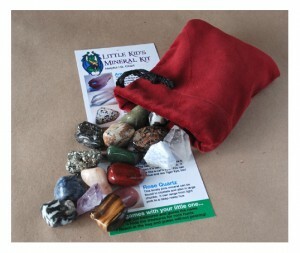 You can find them at our shop site RockHoundKidsShop.com, plus rough and tumbled stones, geodes and other fun accessories! Be sure to take a peek if you are seeking the best in geology education with Dragon Mountain Tresures! it’s our main company objective! day cares, scout groups, we like to offer a discount for your order. such as schools and other educational groups. If you require a purchase order and terms, we’d be happy to help out! for you to turn in for your purchase order. Just click HERE to Email Us! fossils and other exciting geology supplies! better than hands on! Let us help you!